Limit switch safety stops are located on either side of the sanding belt to stop the belt sander if the sanding belt mistracks or breaks. 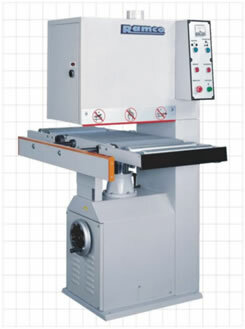 Conveniently located load meter provided for continuous monitoring of the main motor during sander operation. Side access door for quick sanding belt change. Side extension bar provides firm support for wider material. Sanding belt tension and oscillation are pneumatically controlled. Infeed and outfeed roller conveyor extensions are provided for better part support for longer pieces.